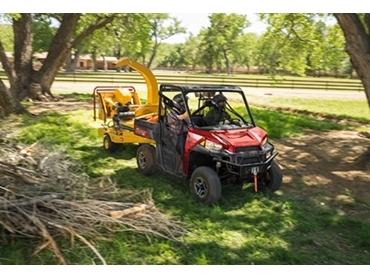 The world-leading manufacturer of off road vehicles, Polaris has expanded its industry-leading range of Ranger off-road utilities and side-by-sides with the launch of the new Ranger 900 XP. The introduction of the new Ranger 900 XP takes the Ranger line-up to 16 unique models. According to Polaris Industries Australia & New Zealand Country Manager, Brad Wolstenholme, the new Ranger 900 XP is powered by a 4-stroke, twin-cylinder, liquid-cooled 900cc ProStar engine pushing out 60hp, and delivers class-leading torque and smooth power through the RPM range thanks to its dual overhead cam design and counterbalancing. Design highlights of the Ranger 900 XP off-road vehicles also include electronic fuel injection, a whopping 26.9cm front and 25.4cm rear suspension travel, On-Demand True All Wheel Drive, 4-wheel hydraulic disc brakes with dual-bore front callipers, a rear box capacity of 454kg and a towing capacity of a staggering 907kg. Premium rims and tyres, a sliding seat and tilt steering, deluxe seats and a custom paint package, 30.5cm ground clearance, seating for three and a stronger, higher torsional stiffness chassis as well as electronic power steering are some of the other features. The Ranger 900 XP complements the ProStar engine with a new, durable drive train built to handle this model’s higher horsepower. Offering more storage in its class for work applications, the off-road vehicle features a new under-seat storage with flip-up access to give the operator increased and easier accessible storage inside the cab, while a new harder working cargo box outside incorporates more tie-down points, easily inserted box dividers and a smoother gate release.